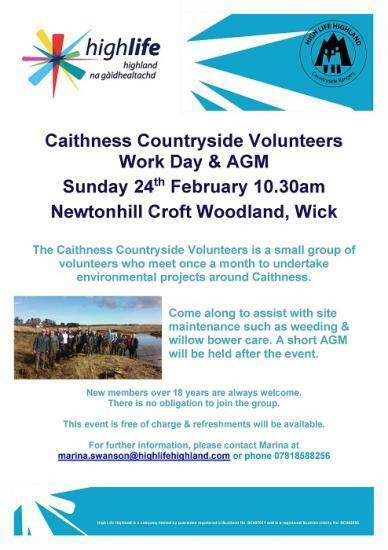 CCV work day and AGM..
After an extremely busy breeding season, most of the nesting birds have now left St Johns Pool, near Dunnet which gave the Caithness Countryside Volunteers the ideal opportunity to get into action before the winter migrants begin to arrive. The volunteers undertook a range of activities such as wood preserving the viewing hides and fence posts. Members of the Caithness Countryside Volunteers turned out in force on Sunday (30 October 2016) to assist with a habitat enhancement project for a rare butterfly species in the Dunnet Bay area. 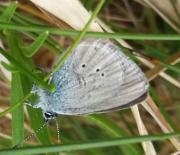 Dunnet Bay is home to the most northerly colony of the Small Blue Butterfly whose caterpillars depend solely on kidney vetch as a food source. Members of the Caithness Countryside Volunteers were pleased with the dry weather on Sunday morning as they were busy painting the second coat of wood preservative at the Loch of Mey bird hide. The local Scottish Ornithologists' Club (SOC) were fortunate to access a grant from the Action Earth Awards to pay for the wood preservative, brushes, wood and guttering to undertake vital repairs at the bird watching facility. The sound of bumblebees buzzing around our flowers on a warm sunny day is a sure sign summer is here. But bumblebees are also an essential part of the countryside, responsible as they are for pollinating our crops and wildflowers. Members of the Caithness Countryside Volunteers, with direction from John Parrott from Coille Alba, undertook control measures on Giant Hogweed along the Wick riverside last weekend. Growing to 20 feet high, this impressive plant was once planted in gardens but has become a problematic invasive species in Britain, particularly along river banks. Scotland’s young people can become healthier, happier, and more employable by taking part in environmental volunteering, according to the chairman of Scottish Natural Heritage (SNH). An estimated 90,000 people take part in environmental or wildlife volunteering in Scotland each year. Pupils at Wick High School have been regularly working with the local Highland Council countryside ranger at Newtonhill Croft Woodland over the last 6 months. The youngsters have been working in all weather conditions and have undertaken a wide range of tasks such as hedge cutting and tree planting. The Caithness Countryside Volunteers ventured across to Mackay country this month to work on a �boggy� project on the flows of Sutherland. The peatlands of Caithness and Sutherland are a globally important habitat and the RSPB are currently undertaking work to restore some areas of former conifer plantation back to native bog.